On May 4, 1999, gripe water production of a factory in SITE was suspended for four weeks, after a task force discovered unhygienic conditions in the basement of the factory. According to a report published in The News the next day, the task force, headed by the then Additional Health Secretary Dr Kamil Rajpar, found fungal growth in some bottles of gripe water, while cobwebs and cockroaches were discovered in the manufacturing area and quality control laboratory. 1881: Karachi's Municipal Secretary and Engineer, Mr. James Strachan conceived the idea of Karachi Tramway around this year and Mr Edward Mathews, of London tendered for the construction of the line in 1881. Maternal, infant mortality: is there a solution? Population growth, while a major problem in itself for the country, is also a harbinger of other related issues. The infant mortality rate in Pakistan is approximately 78 per 1,000 live births. The under-five mortality rate is 94 deaths per 1,000.The maternal mortality ratio is 276 deaths per 100,000 live births,which means that approximately one in every 89 women in Pakistan will die during childbirth. Moreover, the maternal mortality ratio is almost twice as high in rural than Urban areas. A lack of healthcare facilities is responsible for around 10 to 12 per cent of these maternal death. A meeting of civil society organisations from Karachi and Hyderabad was called on Tuesday in Hyderabad. The meeting was chaired by the central steering committee of the movement, comprising Punhal Sario (Sindh Hari Porhiat Council), Veerji Kolhi (Mehrgarh and Kolhi Welfare Association), Jabbar Bhatti (Indus Institute for Research and Education), Zulfiqar Shah (PILER), Rubina Chandio (Pirbhat) and myself. "Chhoti Si Dunya" was a famous series on the official television channel of Pakistan in the late 1980s. A creation of Sindhi writer, Abdul Qadir Jonejo, the play was initially telecast in the Sindhi language. Later, due to its popularity, it was re-telecast in Urdu with Sindhi accents. "Chhoti Si Dunya" can loosely be translated in English as "The Small World." It was one of the most phenomenal dramas in the history of Pakistani television, and was highly appreciated by critics for its script and its production; Abdul Qadir Jonejo became a well-known writer overnight. Chief Drug Inspector Ghulam Rasool Halepota had said to reporters at the time that the case could be sent to the provincial quality control board for prosecution in the drugs courts that had been established under the Drug Act. Despite over 10 years having elapsed since then, the case is yet to be registered in the drugs court, while no follow up has been conducted on the present condition of the factory. When the secretary of the Quality Control Board, a man named Qaiser, was contacted about the gripe water case which is yet to be filed in the drugs court and investigated upon, he was quick to state that he did not have any knowledge about the case. Qaiser claimed that in order to give any basic information, he will have to ask the health secretary. Soon after, he switched off his cell phone. "We have all the required information and have visited these factories a number of times, but nothing concrete comes out as the investigation process is usually bought off by the owners," a drug inspector, speaking on condition of anonymity, alleged. "Corruption is the only answer to why nothing has been done as yet," he said. The inspector said that many officers are simply "powerless," claiming that those who want to carry out their duties are transferred to far off places, until they don't want to work anymore. "Sometimes, what happens is that incomplete information is provided by the drug inspector, and most cases are dropped by a judge on the pretext that information or evidence is missing," another official argued. He further added that a majority of times, the accused plead guilty and pay off the punishment fee. "This is a clear case of providing substandard drugs or medicines to the public, but they are bailable offences, and those guilty can easily pay their way out at the end of the day." The officer cited another case, lodged in the late 1980s, when a children's ointment was found to have powder in it. Since the accused could not be traced, the case is still pending for a hearing, the officer asserted. There are other institutional hurdles as well: the office utilised by drug inspectors is antiquated, with its interior in need of a major uplift. According to the officer, they have not had a stenographer for years, and the judge writes the notices and summons himself. "The process to hire a person is exhaustive and we have no resources to hire someone. That's why we make use of the stuff that we have. This adds to our load of work, but there is no point in complaining," he said. Five other cases were lodged against the manufacturers of gripe water, an internationally renowned company, but each time round, all the accused were acquitted for some unknown reasons. The brand's factory was privatised in 1983, with case entry registers at the drug court clearly detailing that the factory was inspected in the early 80s as well. Four of the five cases against the manufacturers were lodged in 1983 and one in 1985, but no official at the drugs court could clarify the legal reasons behind the exonerations. The first case against Woodward's was filed on January 5, 1983, and the accused were acquitted on January 14, 1987. The second case was lodged on January 6, 1983, and the accused were acquitted on January 20, 2001. The third case was filed on February 8, 1983, and the accused were released on August 27, 1987. The fourth case was lodged on October 20, 1983, with the accused being set free on August 27, 1987. The fifth case was registered on January 23, 1985 but there was no further information in the register as to the outcome of the case. "We are all for accountability and inspection, and our company is among the world's most trusted exporters," said Wasim Pervez, a spokesperson for the gripe water manufacturing company,. "We are inspected twice a year by foreign and local inspectors, and we meet the standards set by the International Organisation for Standardisation (ISO)." Pervez told Kolachi that he did not know of any cases filed against the company, claiming that the company was privatised in 1996, and that he couldn't comment on the matter. Refuting charges of substandard gripe water samples, Pervez said that his company is following good manufacturing practices, and that they could not judge any sample by its cover. "If such a thing happens, the product is referred to laboratories. Up till now, no case of substandard samples has been filed against us," he maintained. The commonly-prescribed gripe water is of no therapeutic value, and should be used as less as possible since it adds nothing of value to a child's health, Division of Women and Child Health Chief Dr Zulfiqar Bhutta told Kolachi. Gripe water, made out of dill seed oil and pepper mint oil, has been used for decades by many mothers, thinking that the carminative will help the digestive system of a newborn. Dr Bhutta refuted such a notion, and said that the reason he won't recommend gripe water is because of the risk of contamination, and the impact it has on exclusive breastfeeding. "A mother's milk has all the necessary ingredients to stabilise a child's health during the lactating period. Carminatives such as gripe water require proper preservation and care, which if not given, may increase the chances of bacteria," he said. "Once you open up the bottle of gripe water, its sterilisation is gone, and it can get germs and bacteria in an instant because of the sweetness of the liquid." Dr Iqbal Memon, a paediatric professor and in charge of the paediatric wing at Civil Hospital Karachi, agreed with Dr Bhutta's assessment, and said that a daily dose of gripe water can reduce the energy levels of a child. "Mothers think that administering a dose of gripe water can help their children in digesting food easily, which it does, but gripe water basically makes children less hungry for food and more dependent on the liquid," he said. "The department has become a den for money makers and for criminals, where good performance at work can be brought against you," a senior official at the health department told Kolachi on condition of anonymity. He argued that there was a need for effective legislation to curb the crime, and to punish those who wreak havoc with the lives of ordinary citizens. If you talk to anybody who has seen Karachi up to 1975, they will talk about the tramways in nostalgic terms. 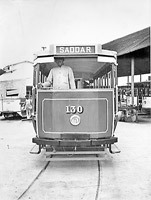 The network was closed down in 1975, after traffic congestion in Saddar area was causing lots of traffic accidents involving trams as well as older trams were proving difficult to maintain. What happened to the rolling stock and infrastructure is anybody's guess. I couldn't find any information on it. Growing up in Karachi however, I remember taking rides in trams with my father as well as seeing the left over tram tracks which were left to rust in Saddar roads until 1980s. The history of Karachi tramway spans 90 years (1885-1975). It owes it origin to the municipal secretary and engineer, James Strachan, who first conceived the idea for a Karachi Tramway. In 1881, Mr. Edward Mathews of London submitted the tender for building this tramway network. It took until 1883 to complete all the formalities and to get the government's permission to use steam as the locomotive power for the trams. Actual construction work started in October 1884. The track gauge of Karachi Tramway was 4 feet. On April 10, 1885 the first tram line in Karachi was opened for public traffic. 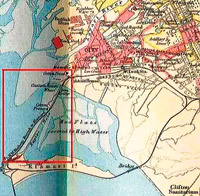 The track extended from present day Jinnah (then Napier Mole) bridge to Keamari. An imposing ceremony was held on this occasion. The dignitaries who attended the ceremony included Commissioner Sindh, Henry Napier B Erskine, Commanding Officer of Sindh District, Brigadier General G. Luck and his daughter, Assistant Commissioner Dr. J. Pollen and His Highness Prince Shere Ali Khan, ex-Wali of Kandhar, Afghanistan, with his staff. All these people were transported to Keamari and then back to Scotch Church on a convoy of Steam Locomotives and using the tramway track which they were going to inaugurate. The marquees of the project had been erected at the Scotch Church. Refreshments were given to the attendees here and Commissioner Sindh in his speech pointed out that Karachi Tramway was the "first steam tramway in Western India." He also pointed out that the tramway was going to be used for passenger as well as freight service. The tramway was needed for freight service as Karachi Port was not deep enough in those days. Ships were anchored at present day Keamari area, and from there freight was brought to Merewether Pier (present-day Jinnah Bridge/Native Jetty area) by small boats. For this purpose some tram rails were laid in the Godowns of Messrs. Ralli Bros. A. McHinh & Co., Volkart Bros., and others, and also along the jetty, so that grain might be transported directly from their warehouses to the boat's side. The Map below shows Karachi of 1893. The Red rectangle towards left shows the first tramway track that was inaugurated. Also note how Karachi landscape has changed since then. Keamari is now part of the mainland as sea has receded a lot as well as land reclamation that has happened in the last 100 years. See where 'bridge' is written on a railway line towards bottom. This is where present day Boat-Basin is located. In 1886, steam powered trams got replaced by horse driven tramways. This was to the great satisfaction of city residents because the steam engines proved to be too noisy in the residential and commercial areas. The frequency of steam trams was once every 15 minutes in busy areas and that made the residents quite uneasy because of the noise. After horse trams were introduced, steam trams were relegated to shunting in depots only whereas light one-horse tram cars took their space on Karachi roads. Very soon the horse driven tramways became bigger than ever. Some of carriages were converted to light railways and the tramway started moving not only passengers but also freight across the city by using petrol engines. The company was now titled as 'The East India Tramways Company'. The chief engineer of the East India Tramway Company was John Brunton, whose name was long known in Karachi in connection with the Karachi-Kotri railway line which was constructed under his supervision. The permanent way materials for the Karachi tram network was supplied by Messrs. Bolling and Lowe of London. The weight of the rails used in the tramway was 70 lb (32 kg) to the yard. The engines of the tramway were supplied by Messrs. Kitson and Co. of Leeds, the rolling-stock was supplied by the Starbuck Car and Wagon Company, of Birkenhead and the contractors who carried out the construction work were Messrs. Mathews and Crawford. "The tramcars of Karachi have rendered yeoman service. But it is time they were removed. It is high time every part of the city was served by a service which we trust will be as clean and as efficient as that of the East India Tramway Co. of Karachi or better still of the best of Bombay." The article first appeared on Pakistaniat.com; credits for pictures are available on the site. February 8, 1883: Detailed plan for Karachi Tramway is made and settled. Permission is obtained from the government for the use of steam powered trams. April 20, 1885: Steam Tramway was opened in Karachi. There was a ceremonial opening of the Main Line from Scots Kirk neat St Andrew's Church (located on present day Abdullah Haroon Road and Shara-e-Liaqat intersection) to Kiamari. Goods line between McLeod Road (now I.I. Chundrigar Road) and Native Jetty were also completed. Steam traction with Kitson Locomotives was used for all traffic. These were single deck 4-wheeled back-to-back cross bench cars, had 8 ft wheel base, were 28 feet long,and 6 feet 8 inches wide. These cars were built between 1924 and 1948. They were equipped with Perkins P.4 Diesel Engines and Simplex (Dixon-Abbott) Gearboxes. These figures were revealed recently during a three-day media workshop on reproductive health issues, organised by the National Committee for Maternal and Neonatal Health, in coordination with Panos South Asia. All, however, is not doom and gloom. Pakistan has the potential to resolve these problems with comprehensive strategies and policies, implemented through collective efforts. Above everything, the National Committee for Maternal and Neonatal Health needs to reinforce its budget. Next, the status quo of gender disparity needs to be broken. Poverty also remain a serious problem for Pakistan, with 100 million citizens — over 60 per cent of the population — living on less than Rs165 per day. The Sindh health department claims to be making efforts to overcome the population growth rate by introduced reproductive health methods and facilitating people by educating them about these issues. Reproductive Health Services Units have been established in every district to provide door-to-door services through Lady Health Workers (LHW), whose job is to motivate people to consider and make use of family planning methods. LHWs try to motivate couples to control the size of their families. They urge women to use contraceptive methods. According to them, however, 43 married women, out of every 100, do not intend to use family planning methods. Men, on the other hand, also refuse to use contraceptives, and consider vasectomy a cultural tabboo. Eight babies are born every minute in Pakistan, and if this birth rate continues,the population of the Pakistan will have quintupled over the next five years, putting a further strain on already scarce resources, and thus, enhancing poverty. Dr: Kalsoom Azad Lashari, an assistant professor and in-charge of the gynaecology ward of the Lady Willington Hospital in Khairpur, told Indus Watch that 80 per cent of all deliveries in rural areas are done at the patients' homes. As many as 500 women out of every 100,000 die during childbirth, while the numbers in developed countries is only 10 among 100,000. She said that due to the lack of education and awareness, most women still prefer to have unskilled attendants while giving birth to their children. Around 600 cases of botched childbirth are reported annually in Khairpur, said Dr Lashari, who has personally attended to many women who were brought to her hospital with complications such as perforation, Septicaemia, kidney failure, and septic shock. She said that the reason behind the complications was home delivery at the hands of unskilled birth attendants. There is a severe lack of public penetration and facilities, she said, adding that most women who do come to the hospital do so without their husbands, because the latter frown upon hospitals for childbirth. "Only one per cent of the women who come to my hospital are accompanied by their husbands, and even then, they are brought in only when the case has become very complicated," Dr Lashari said. "As a doctor, I give priority to cases on the basis of severity. If the woman dies, her family protests and accuses the doctor for her death. They never realise their own mistake and responsibility. People bring women here in critical conditions, when the chances of survival are already bleak. Instead of accepting responsibility for the delay, however, they accuse the doctor for the woman's death." Every gynaecologist at a public-sector hospital usually examines around 100 patients every day, she said. There are a lack of facilities in public-sector hospitals, along with a lack of staff. She said that the attitude of doctors towards patients is polite, but the attitude of the patients' attendants is far from civil. "No one reports on the 'services' of untrained midwives," she said. "This further alienates people and keeps them away from hospitals; and then they bring in cases only when they are complicated, thus perpetuating the cycle." Dr Lashari urged for greater awareness regarding all these issues. Journalists, clergy, NGOs and educated people can motivate people to use contraceptive methods in order to overcome the population growth and motivate them to reduce maternal and infant mortality rates. She advised the government to empower women and take professionals into confidence while formulating health policy. Reproductive health as a subject should be introduced in the syllabus from middle school to higher secondary schools, she said. The government should also revise its healthcare budget to meet targets. Khairpur Rural Development Organisation representative Ikhtiar Khaskhely was of the opinion that poverty and illiteracy should be addressed in order to overcome these issues. Rural Women are subjected to violence by their men, which increases the rates of maternal mortality. They are deprived of nutrition, which causes anaemia. Public-sector hospitals are not providing proper facilities, he claimed, adding that most rural health centres and basic health units have insufficient female doctors. He added that the government should crack down against quacks, while the salaries of LHWs should be increased. "It is the duty of the State to provide basic facilities to people," he maintained. "Reproductive health-based seminars should be organised at the district-level, and journalists should be sensitised to report such issues sensibly," Lady Willington Hospital Khairpur Resident Medical Officer Dr Aijaz Sammo, said. "Only after addressing all these issues will we be able to reach our millennium development goals on time." We all are well aware that couple of months ago, 17-year-old Kasthuri Kolhi was allegedly gang-raped by three members of the Khoso clan in Nagarparker. Till now, however, no action has been taken against the accused. They are moving around freely without any fear of imprisonment or being punished. The police of the area are also supporting and the protecting the culprits and threatening Kasthuri's family. Since then, human rights activists in Sindh have been raising their voice and staging protests and rallies, and observing hunger strikes across the province, demanding justice for Kasthuri and the detainment of the accused. The State organs, however, seem to have turned a blind eye to the girl's plight. After deliberations during the meeting on Tuesday, we have decided to form a four-member ìKasthuri Case Action Committeeî. The purpose of this committee will be to provide legal support to the Kolhi Welfare Association, which has been spearheading the movement to provide justice to Kasthuri Kolhi. The committee will also contact bar associations and professionals in Karachi and Hyderabad to raise awareness about the case; it will meet representatives of the Supreme Court and human rights organisations for support regarding the case. The committee will also monitor legal proceedings of the case at the Mithi Sessions Court, and ensue mass participation of lawyers and human rights activists during the hearings. We will also decide on a specific day when demonstrations in support of Kasthuri will be called in every district headquarter of Sindh. Our main purpose is to build a sound movement in order to ensure justice for Kasthuri, and to see that the her alleged rapists are punished according to the law of the land. — Zulfiqar Shah and Jabbar Bhatti, Hyderabad. The play presents the story of a young villager, Murad Ali — a guide for a British archaeologist and historian, who was also a lord. This British lord and archaeologist liked Ali and took him back to London. Ali lived there for six years, after which he returned home. On his return, however, he began to dislike the traditions of his village, and acted like a stranger. He behaved like a British lord when his fellow villagers welcome him. He informs them that there are (new) etiquettes and manners that need to be followed when they greet him. He orders them to make a line and shake hands using only one hand. He also argues that the old manners are outdated; therefore they need to follow modern customs. I am going to present here one story from "Chhoti Si Dunya" to explain how the people of the village behaved with Murad Ali Khan at different occasions. This story of "Angrezi k_ Mal_khr_" (literal translation: "wrestling of the English language") begins when Suleman, a resident of the village, goes to Murad Ali to ask him to write an application on Suleman's behalf to the police against his nemesis, who lives in a nearby village. Suleman describes the background of the problem and the reasons for the conflict. Ali gets irritated and insists that Suleman should tell him only what he has to write in the application. After Ali makes many repetitive requests to Suleman to explain the matter in simple terms, Suleman is not able to tell him exactly what to write. At last, Ali flat out refuses to write the application, claiming that Suleman is not telling him what to write. This angers Suleman, who alleges that Ali is refusing to write his application because he does not know how to write in English. This news spreads in the village, and everyone thinks that Ali does not know English, and that, he had never really been to England. Bhoro, another villager, and Suleman scheme together to arrange a "match" of the English language between Murad Ali and Janu German — a resident of a nearby village, who also claims to know English — to decide whether or not Murad Ali knows the language. The date for the competition is finalised, and Khan and Janu German agree to participate. On the day of the match, Ali and Janu German come with their supports; each group thinks that their candidate knows English better than the other. According to the rules of the match, first Janu German will ask Ali three questions, which the latter will have to answer. Then Ali will ask Janu German three questions. In the second round, each candidate has to relate a story in English, after which, the jury will decide the winner. Interestingly, no one from the village knows a single word of English. Janu German only knows how to say a few words, but does not know what they mean. Since the villagers don't know English, they don't really know whether Janu German really knows English. The match starts, and Janu German asks the first question. "That," he says. Ali gets confused, while one of his companions tries to encourage him by behaving like people do in a rooster-fight, and constantly egging him on to "fight back". Ali tells him to be quiet, and says that he is going to respond, while Bhoro, who supports Janu German, tells Ali's supporters that his candidate has confused their "Saheb". The third judge, Suleman, who has a leading role in the match tells everyone to be silent, while Ali responds to Janu German's question with, "What do you mean by that?" Ali's supporters applaud and become happy that he has responded to the opponent's question. Then comes the next question from Janu German: "Why?" Ali gets confused once again, but eventually comes up with a response: "I don't understand your question." Not understanding a word, and only seeing Ali speak in English, his supporters rejoice, thinking that he has answered Janu German's question, which they had not understood either. The judge asks Janu German for the third question. He says: "Where?" This time around Ali gets angry and says, "Oh my God! Are you a crazy man?" Bhoro, Janu German's supporter, stands up and says to Suleman, "This is not fair!" Ramzan, Ali's supporter, asks, "What is not fair?" Bhoro says that Janu German asks questions with one word, while Murad Ali answers in very big sentences. Suleman orders everyone to be silent, and says to Bhoro, "This is not a match of words; this is a match of the English language. You should be silent. At this time, I will not take anyone's side, because I am a judge." He orders the match to continue, and requests Ali to ask questions from Janu German. Ramzan recites some religious verses over Ali so that he can win the match. When Ali notices this, he asks Ramzan what is he doing and tells him to stop. Ali then asks Janu German, "What is your name?" Janu German responds, "One two three." Khan says, "But that is not the answer to my question." Janu German responds, "Four five six eight ninety nine." Bhoro says, "Chacha (uncle) Ramzan, do you know that Janu German is an expert of the English language? This is really the English language!" At that point, Ramzan insists that Ali allow him to put some drops of water on his face. Usually, during rooster-fights in rural Sindh, people put some drops of water on the roosters to make them fresh. Ali says, "There is injustice going on here. I would have boycotted this match, but will continue and accept the jury's decision in the spirit of sportsmanship." Ramzan in turn, offers him milk, but Ali refuses and says, "Don't give me a headache. Please sit down." Ramzan argues that the opponent is a very good player, but Ali insists that he should sit down. At last, Ramzan gives up and sits down unwillingly. Then, Bhoro says, "Chacha Ramzan, tell your Saheb to study for seven more years abroad. There is really a difference between Germany and abroad. One who goes to Germany knows better English than one who goes abroad." He meant that people in Germany know English better than people in England. Murad asks his last question, "Please give me a proper answer." Janu German says, "Eleven twelve eighty eight ninety nine hundred." Suleman announces that the first round has come to an end. Now, it is time for the second round where each participant has to tell a story in English. Janu German goes first. He laughs for a while and says, "One …one two four five… five eight nine ninety nine…hundred and hundred and twelve and thirty three… thirty three and forty four and forty five… thank you… very much… that... why… where…. goodbye… goodnight… half mind." Then it is Ali's turn to narrate a story in English; Ramzan again insists that Ali should drink the milk, but the latter refuses, and begins his story: "For quite a while, my good old friend, Mr Ramzan, has been telling me to drink a glass of milk, so that I am able to fight this person who doesn't know even a single word of English. So, please, why don't you excuse me on this occasion? That's all, my good, old justice." After the second round comes to an end, Suleman says, "Brothers, we three judges have heard the competition of the English language between Janu German and Murad Ali very seriously. We have concentrated on each and every word uttered by them. They gave each other a very tough time, as you have heard and observed. Though we have decided about the winner, for the sake of assuring that justice has been done, I will ask some questions from all of you." "Did Murad Ali Khan use the word 'Ramzan' when he spoke the English language," he asks. Everyone says, 'yes.' Then he asks Ali if he did, and Ali responds in the affirmative. Suleman continues, "After that, did Murad Ali use the word 'glass'?" The people agree, so does Ali. And at last, Suleman asks, "After that, you used the word 'so'?" Murad Ali says, "Yes, I did." Before giving the final judgment, Suleman says, "This means that Murad Ali has used three words of the Sindhi language in an English competition — Ramzan, glass, and so. Janu German did not utter a single word of our language in the English competition. This means that this competition has been won by Janu German." What was Suleman talking about? Abdur Qadir Junejo shows that the villagers made their decision based upon their understating that "Ramzan" cannot be used in the English language because it is a Sindhi name. "Glass" was also considered to be a Sindhi word as it has same meaning in Sindhi as in English. Moreover, in Sindhi, "so" means "one hundred" and the villagers thought that Murad Ali used the Sindhi word "so". After the competition, however, the villagers ask Ali for forgiveness, just as they do every other time after doing something that doesn't make sense to Murad Ali Khan. It is interesting to note that although the playwright wanted to show that Ali had deviated from village traditions after becoming "westernised," and that was the thesis of the play, each and every time Ali was dominant over the village folks, they had to reconcile with him on his terms and conditions to end the dispute. Interestingly, it was shown in the play that the villagers come to ask for forgiveness from Murad Ali Khan, not because they realised that they did not know English and their judgment was wrong, but because Janu German is from another village and Ali belongs to their own village; therefore, they felt that Ali's loss was not good for the reputation of their village. Thus, the villagers are portrayed in the play as stupid people who do not make decisions on the basis of rationality. Though this play was a critique of Sindhis, who, after returning from abroad, behave in a "Western" style, I read it differently than the normative praise given to it. I argue that although this play seems critical of Murad Ali, it actually defends Murad Ali, and principally criticises the village folks in a subtle way. I am not arguing that the writer has done this through a judgemental perspective, but rather through his best efforts, he has a written satirical prose to defend his traditions and cultural values. My reading of this play is based upon the argument that colonial modernity is proliferated, perpetuated, and embodied in different genres of colonial and post-colonial writing. This play provides images of Sindh and Sindhi people to the wider public of Pakistan in the post-colonial State, through a national television channel in the Urdu language. The re-telecasting of the play in Urdu made it possible for it to be viewed all over Pakistan since Urdu is the language of communication in the country. Thus, the images of colonial modernity and governance, which were embedded in this play as satire, have become a standard representation of rural Sindh in the minds of viewers all around Pakistan. The people of Sindh and the people of "Chhoti Si Dunya" have become synonymous and begin to define and translate each other. The satirical way of describing the play's characters becomes an "ideal, typical personality type" of the rural Sindhi population. There are no boundaries between critiques of Sindhis coming from abroad and behaving in a Western style and mocking rural Sindhi people as having funny views about the Westernised Sindhis (Murad Ali). Thus, what was actually intended to be satire by the playwright, has ended up, primarily on account on ignorance of local culture of the "other", as becoming a kind of accepted "true" representation of Sindh and Sindhi people.